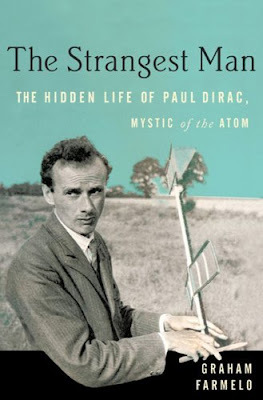 My online review of the recent biography about the quantum physicist Paul A. M. Dirac, has just been published by the New York Journal of Books. Dirac predicted the existence of antimatter in 1928, but didn't hype it ... out of "shear cowardice." He also formulated the original many-body description of how light interacts with matter (Quantum Electrodynamics but, as Graham Farmelo informs us, Dirac felt it was flawed and that ultimately he had failed to fix it. The book jacket shows a 31 year old Dirac in the grounds of The King's Head, near Thorpe-le-Soken, Essex. (Pop quiz: What is Dirac holding?) By that time, Dirac was already the youngest winner of the Nobel Prize in Physics and had a day job as Lucasian Professor of Mathematics at Cambridge University. Problem: How was he going to top that?